Don't get me wrong, moving to another country on your year abroad is hard. Unless you've done it yourself, I don't quite think anyone will ever understand the magnitude of emotions you experience. It is bloody terrifying. But that is because everything is new. Most people have no idea what they are going in to, or in many cases, had even visited the place they were moving to before. It is one big leap of courage into the unknown. But by now, you've all done it and it's now time to turn your thoughts to moving back to the UK. Or indeed wherever you left. Your last few weeks will undoubtedly be the hardest ones of your whole year. Not only are you saying goodbye to the people that have helped define your experience, whether it be friends or flatmates or colleagues, you are leaving a place that you've finally gotten used to. You've finally remembered to do the food shop on a Saturday night because the shops aren't open on a Sunday, you've gotten used to holding on to those plastic bottles to get your pfand back and you are no longer the tourist in your town. Not quite a local, but definitely one of them. Paperwork: Boring as anything when all you want to be doing is making more special memories but trust me, you definitely need to make time for the paperwork too. Check online if there are any forms you need to bring with you when you deregister as a citizen and whatever you do, don't use your bank card in the days leading up to closing your account. Learn from my mistakes. Please. Make a List: If there are things you want to do and see before you leave then write them all down and make plans to do them! I spent my last few weeks in a bit of a haze and missed out on visiting a couple of places I wanted to. Don't put pressure on yourself to see and do everything, it will give you an extra excuse to come back and visit, but if there's something special you want to do then do it! Goodbyes: I hate goodbyes, but I would always much rather my last time seeing someone was doing something special or even just meeting to say a proper goodbye. I had a beautiful lunch with all my flatmates, went for a traditional beer and Bavarian dinner with my friends, and spent my last lessons at school eating cupcakes and playing outside with my "children." Those memories are so special and I am so glad that I made the time for a proper goodbye. Tissues: Bring tissues to everything. If you aren't crying someone else will be. Don't be embarrassed to cry on your flight home either. I got on a flight to Dusseldorf and bawled my eyes out for a good half hour. The man sitting beside me was very confused but I thought, hey I will only see this man once in my life I don't care if he sees me cry. He was also on my connecting flight to Glasgow. Happy days. Enjoy it: As hard as it might be, these last few weeks are such an amazing opportunity to spend time with special people and savour the last tastes of local culture and experiences. So just get out there and have the best time! Are you moving back to the UK after a year abroad? How are you feeling? Please please let me know in the comments I'd love to hear about your experience! PS! 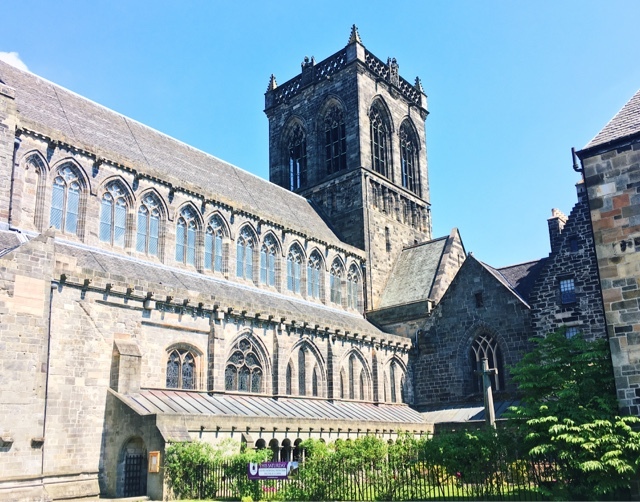 The photo in this post is actually of Paisley Abbey which is really near where the wedding was the other week! Isn't it pretty? !